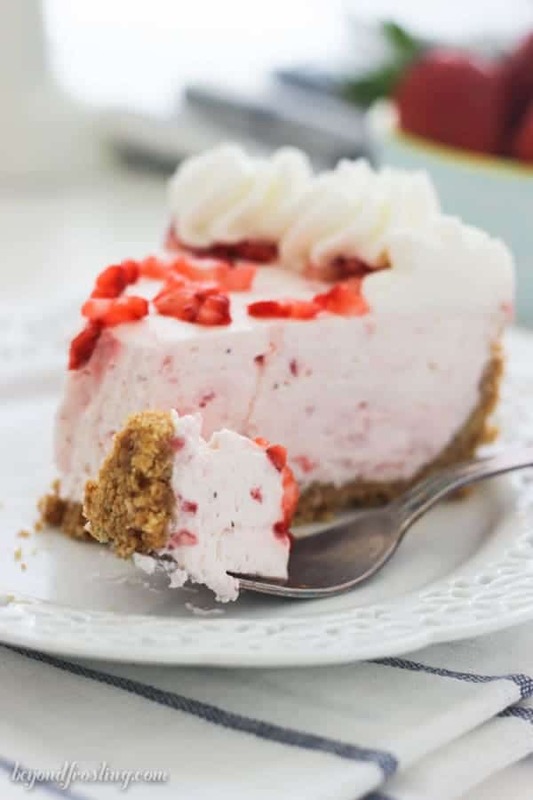 A fluffy, smooth strawberry cheesecake infused with marshmallow crème. 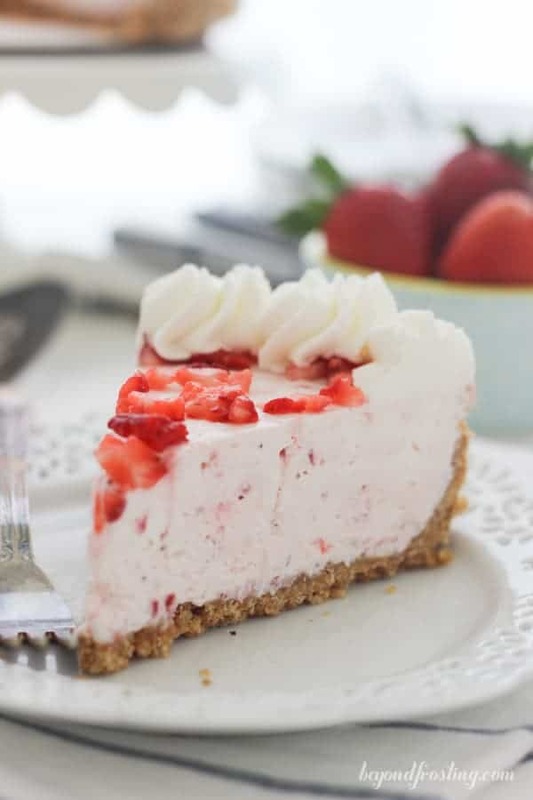 This is the best no-bake strawberry pie that you will ever have! I understand that some of you are still digging out from last week’s snow storm, but we are in full Strawberry season here. This past weekend, I (along with Dorothy and Lindsay) hosted a group of food bloggers here in Southern California. I have so much more to tell you about it this later this week! While we ate a TON of food, it seemed everyone was particularly impressed with the fresh fruit! I love to use fresh fruit when it comes to dessert! 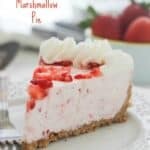 This Easy Strawberry Marshmallow Pie tastes like a fresh strawberry milkshake. It it a no-bake strawberry cheesecake that is mixed with a jar of Jet-Puffed Marshmallow Crème, which gives this dessert the most lightest and fluffy texture EVER! 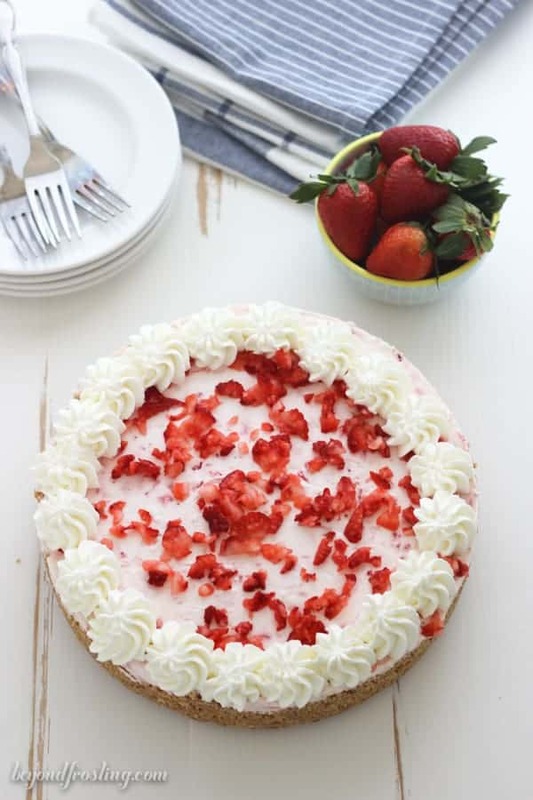 It topped with whipped cream and chopped strawberries. 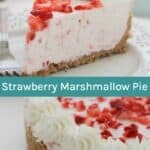 Marshmallow pies are what I like to call “next level” when it comes to no-bake pies. The marshmallow crème is filled with air and when mixed into pie, that fluffiness is distributed throughout the pie. It is a glorious thing. I have a Biscoff Marshmallow Pie and also a Nutella version as well. 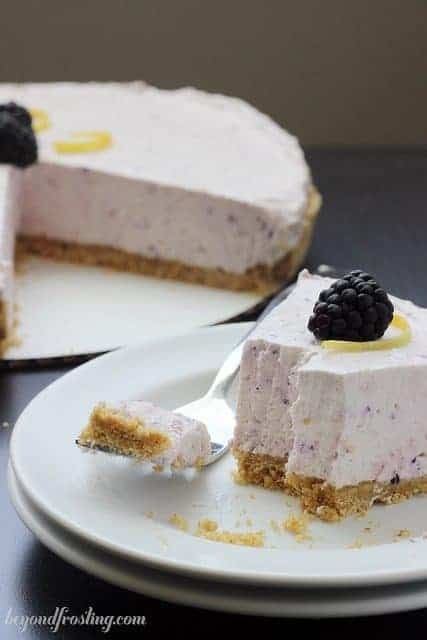 I like to make this pie in a spring form pan because I like the sides to be straight, but a store-bought graham cracker crust would work out just as well. 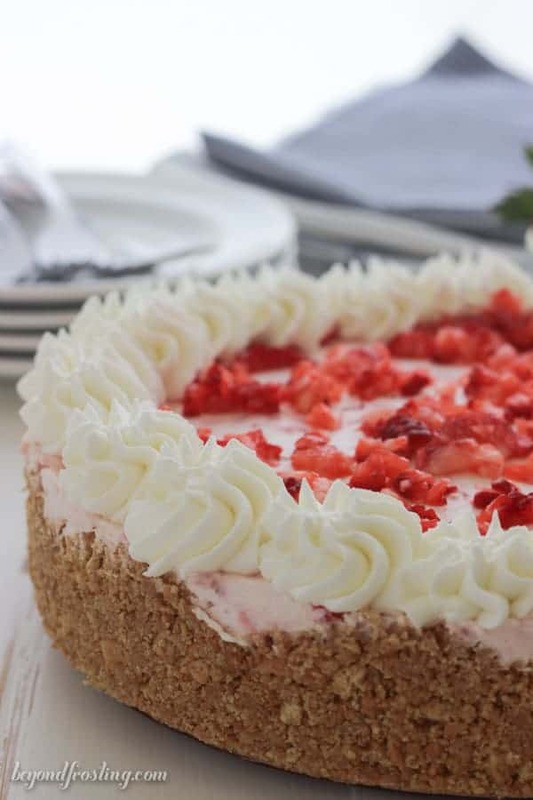 The graham cracker crust is so easy to make. You just need to pulverize the graham crackers in a food processor until they are crumbs. Then you melt some butter over top and stir until the crumbs are well coated. Then you just press them into the pan. It seems like a daunting task, but you just need to be sure the crust is wet enough to press in the pan. Make sure you see all my tips for how to make a crust in a springform pan. Berries can be tricky to work with because they can be very wet, and change the texture and integrity of the dessert. Whenever I work with berries, I always wash and dry them (as best as I can) before adding to the dessert. I also spoon them into the mixing bowl and opposed to pouring them in. That way, you can control amount of liquid that you are putting into your batter. You want the strawberries to be very finely chopped for the filling. Once all of your ingredients are mixed for the filling, you just need to pour them into your crust and let it sit for a couple hours to get firm. You can decorate this pie any way you see fit. I sprinkled it with additional strawberries and whipped cream. You just might want to keep this dessert for yourself because it is that good. Thaw the Cool Whip and then wash and dry strawberries thoroughly. For the crust, grind the graham crackers into a fine crumb using a food processor or blender. Put crumbs in a microwave-safe bowl. Add butter and microwave for 45-60 seconds until butter is melted. Stir to coat graham crackers in butter. Line the bottom of a 9”spring form pan with tin foil. Press crust into the bottom of the pan and gently push it against the sides to form the crust. 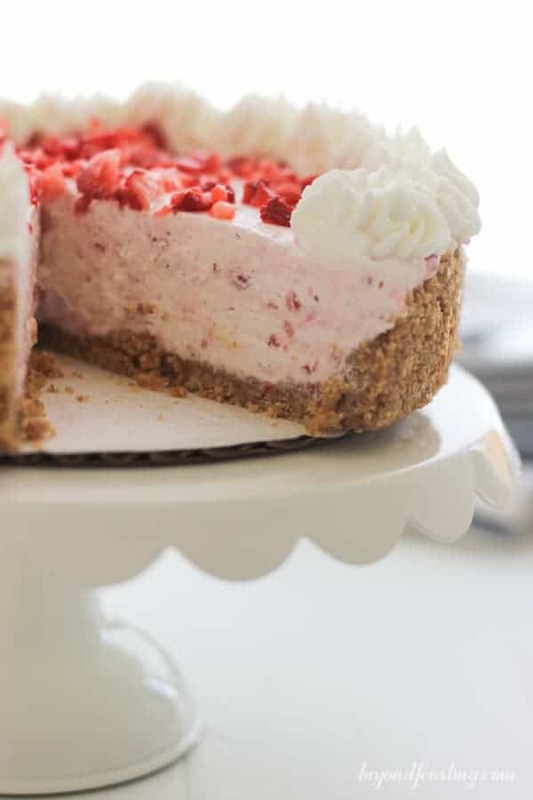 Refrigerate until the filling is ready. Beat cream cheese on medium-high speed for 2-3 minutes until cream cheese is smooth and free of lumps. Scrape down the sides of the bowl occasionally. Add marshmallow fluff and beat into cream cheese until smooth and well mixed. Empty 1 jar of Cool Whip into mixing bowl and mix until incorporated. Use a food processor and tap a few times to chop strawberries into small pieces. Spoon strawberries into mixer and zest lemon into mixing bowl. Turn mixer to medium-high and beat until strawberries are well incorporated into batter. Pour into prepared pie crust and refrigerate for 2-4 hours until firm. Top with the other container of Cool Whip and sprinkle with leftover strawberries. 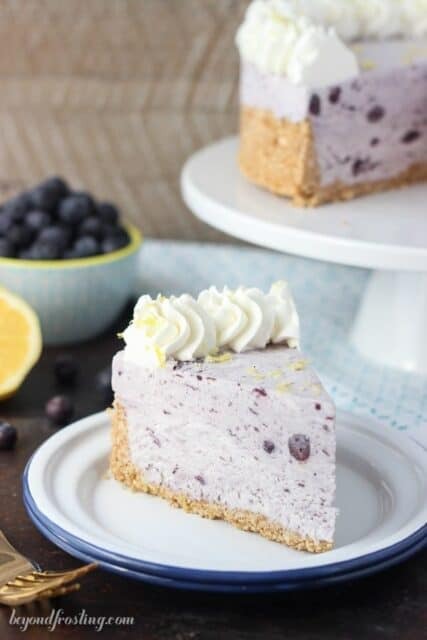 – To make this pie easier, you can use a prepare graham cracker pie crust. – The “prep time” includes allowing the Cool Whip to Thaw. – The “cook time” is time this pie needs to rest in the refrigerator. There is no actual baking involved in this recipe. I made this pie for company tonight and it was a fail I had the pie in fridge for 4 hours and it was mush and fall apart. Won’t make again! Hi Sonia, I am sorry to hear you had a bad experience with this. I’ve never experienced what you’re describing. A couple of possibilities, were the strawberries too wet when you added them, leaving extra water and moisture? Did you use a full-fat cream cheese? Between the cream cheese, marshmallow creme and Cool Whip there should be plenty of stability here. So yummy! So easy! Don’t change a thing! I wonder how far in advance I could make this pie? I want to serve it Sunday evening and would love to make it tonight, Friday evening….do you think two days in the fridge is too long? Hi Stefanie, sorru I didn’t see your comment early. A day in advance is more than acceptable. I might save the whipped topping to add before serving. 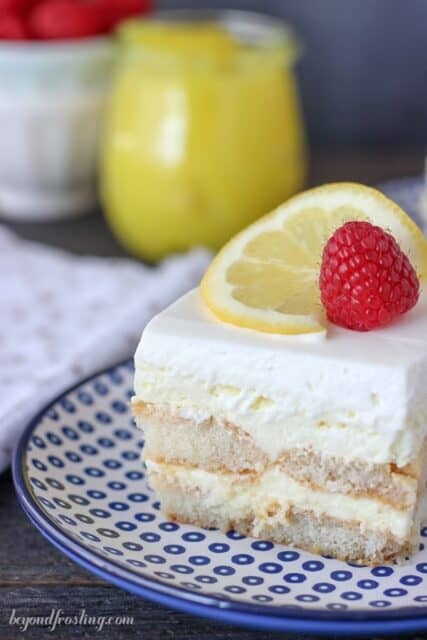 Well, I made this and my husband said it was his favorite dessert I have made to date! !